How to find the vertex and axis of symmetry of a quadratic equation or quadratic function? How to solve word problems using quadratic equations? 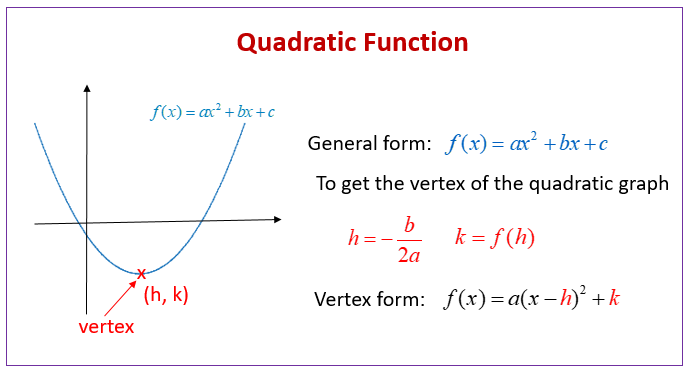 The following diagrams show how to find the vertex of a quadratic function and use that to convert from the general form to the vertex form. Scroll down the page for more examples and solutions for quadratic equations. In a parabola, the vertex is the highest or lowest point on a parabola. To calculate the vertex of a parabola, we can first calculate the x-value by dividing the opposite of the " b" value by 2 times the "a" value. The vertex is the highest point if the parabola opens downward and the lowest point if the parabola opens upward. The axis of symmetry is the line that cuts the parabola into 2 matching halves and the vertex lies on the axis of symmetry. How to find find the vertex, axis of symmetry, domain and range, and x and y intercepts for a quadratic function algebraically? In Algebra I and Algebra II, we sometimes need to solve word problems using quadratic equations. When solving word problems, some common quadratic equation applications include projectile motion problems and Geometry area problems. The most important thing when solving these types of problems is to make sure that they are set up correctly so we can use the quadratic equation to easily solve them. How to solve a quadratic word problem that involves the area of a rectangle? Suppose the area of a rectangle is 114.4 m2 and the length is 14 m longer than the width. Find the length and width of the rectangle. Suppose Jessica drove 100 miles and then increased her speed by 30 mph for the following 200 miles. If the second part took 1 hour less than the first part, what was her average speed? How long was the projectile in the air? When did it reach its maximum height? What was its maximum height? A ball is shot into the air from the edge of a building 50 feet above the ground. Its initial velocity is 20 feet per second. The equation is h = -16t2 + 20t + 50 can be used to model the height of the ball after t seconds. About how long does it take for the ball to hit the ground?